We just came back from our family vacation at Blue Mountain Beach, FL. My first thought on booking this site was “mountains” in Florida! Well it turns out Blue Mountain was built on large sand dunes and that the area was originally named that by sailors who saw the high dunes covered with local blue lupine flowers. The week was wonderful seeing four little boys (cousins) get acquainted again and just watching them interact with each other was so cute. One night while being read to Milo (the oldest, 4) and his cousin Oliver (3) were holding hands as one laid on the bottom bunk of the bed and the other one on the floor. I wish I had a picture of that. All I can say is awwww! After a week of fun in the sun, some bike riding, lots of cooking and drinking we had to say goodbye to each family as they headed home. As we stood at the top of the stairs and waved goodbye to each family, it was nice thinking of the time we had just spent together. Since we were so close to Panama City Beach, FL we decided to head over there for a couple of days. 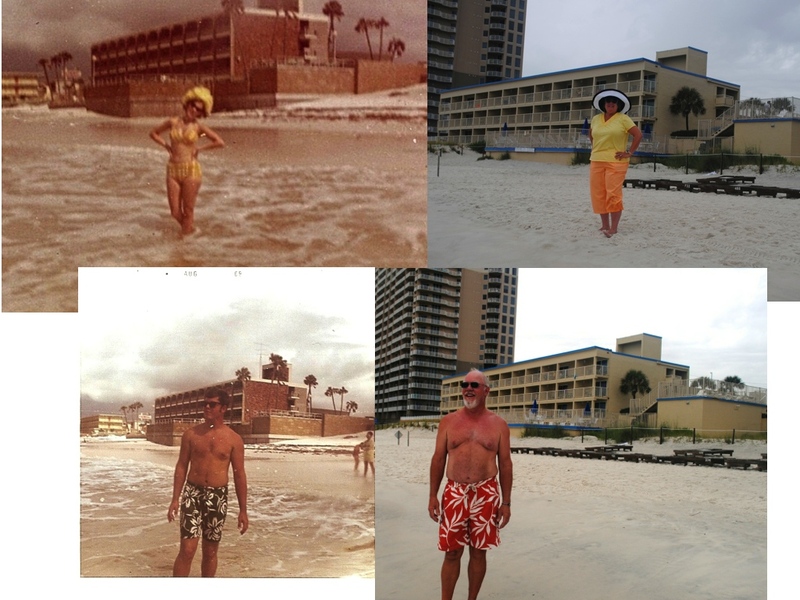 This is where we spent our honeymoon in August 1969 (right when hurricane Camille was coming ashore). Thinking back, it was kind of funny. We were the only car going south at that time, everyone else was evacuating. As it turned out, it did not hit our part of the beach but went on to Mississippi. We actually stayed in the same honeymoon hotel and did our “then and now” pictures on the beach (see below but WARNING! I look nothing like I did 44 years ago). 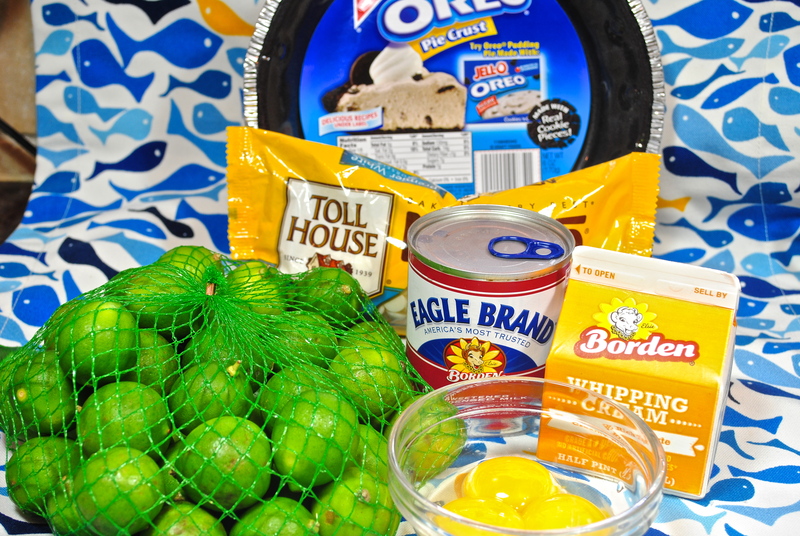 You say why mess with a standard recipe like key lime pie. Well, I really liked the white chocolate version but missed the sweetened condensed milk in the pie so I simply combined the two recipes. 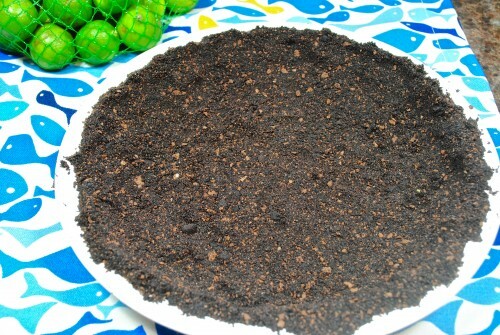 I could not find chocolate wafer cookies so I bought an Oreo cookie crust. Since I did not want to make this pie in a “throw away” pie tin I crumbled the crust back up and pressed into the glass pan. Next time I will probably buy Oreo cookies and scrape out the filling and make crumbs in the processor. You will notice in the picture that the crust has light and dark chocolate; that is because I tried to mix in some chocolate graham cracker crumbs with the Oreo crust. One was dark chocolate and one lighter. Next time I will buy Oreo cookies, scrape out filling and make my own crumbs. OR, you can simply make it in the Oreo chocolate crust. I was afraid mixing the two recipes that there would be more filling than would fit in one of those type crust. 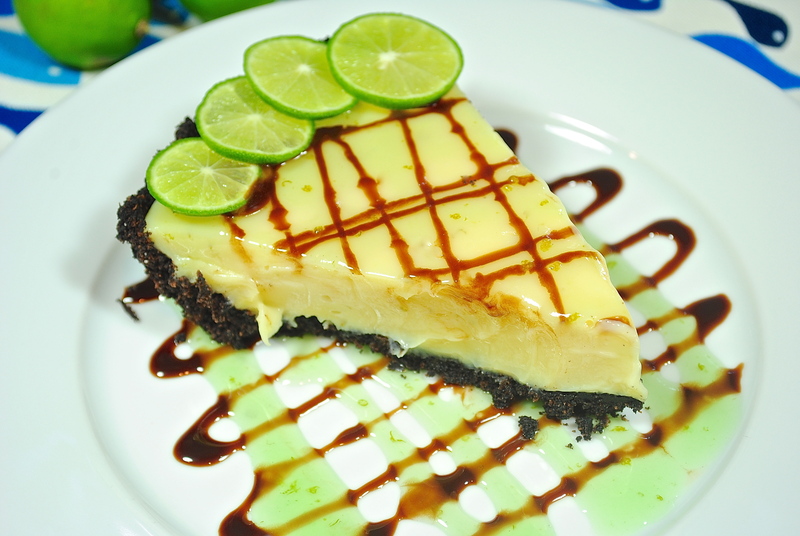 You do not have to make the key lime sauce for the top, you could simply decorate it with some slices of key lime and whipped cream, maybe a drizzle of some kind of chocolate sauce on the plate would be pretty. Use key limes or Persian limes. I mixed the chocolate graham cracker crumbs with the oreo cookie crumb crust. Didn’t turn out as pretty as I wanted. Next time I will scrape out Oreos and make my own crumbs. Heat the whipping cream in a glass bowl set over simmer water. When hot add in the white chocolate chips and let set for 5-6 minutes then stir until melted. Mix the sweetened condensed milk with the lime zest, lime juice and the egg yolks. Mix until well blended. 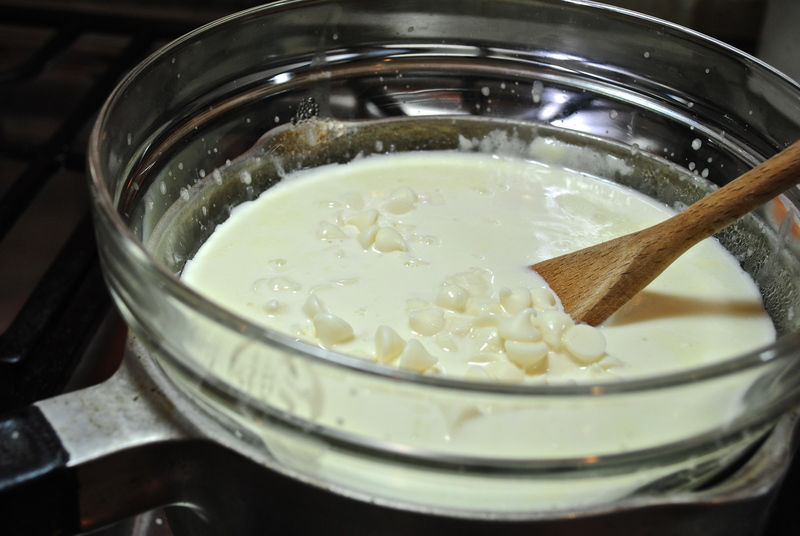 Then stir the milk/egg mixture in with the melted white chocolate mixture. Pour into cooled pie crust and bake in 325° oven for 15 minutes. Remove from oven cool then refrigerate until very cold 3-4 hours. 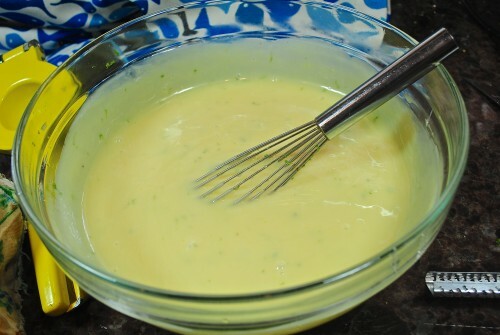 My key lime sauce. You can skip this step if you want. 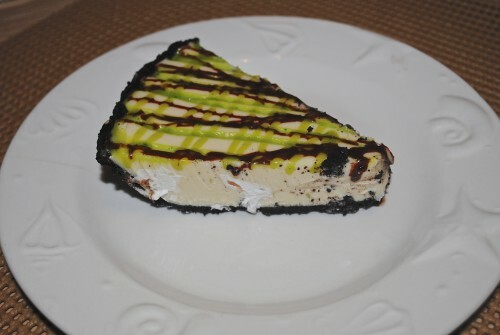 Key lime pie is never suppose to be tinted green but the sauce had to be tinted to show up on the plate and the pie when drizzled. 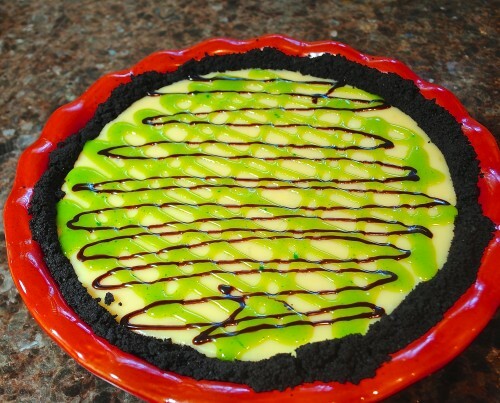 Using your key lime sauce (or the plate scrapers) and chocolate sauce make a criss-cross design across the pie. 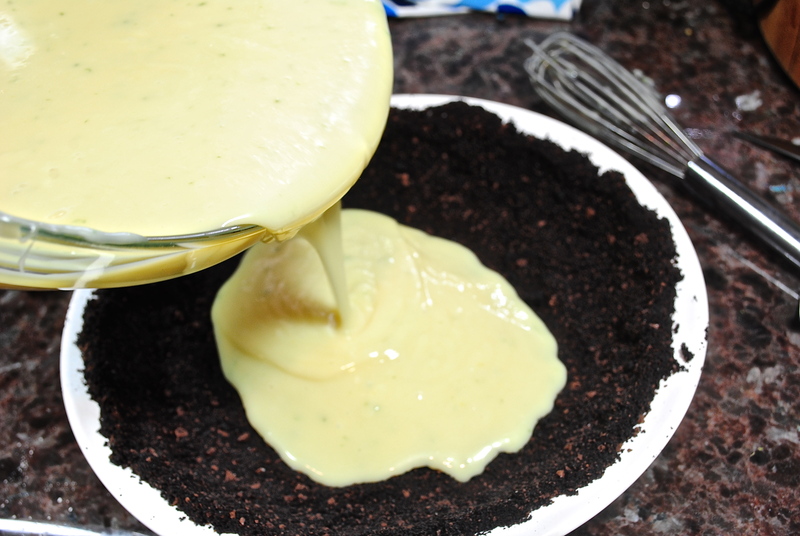 Drizzle the plate with the chocolate and key lime sauces. 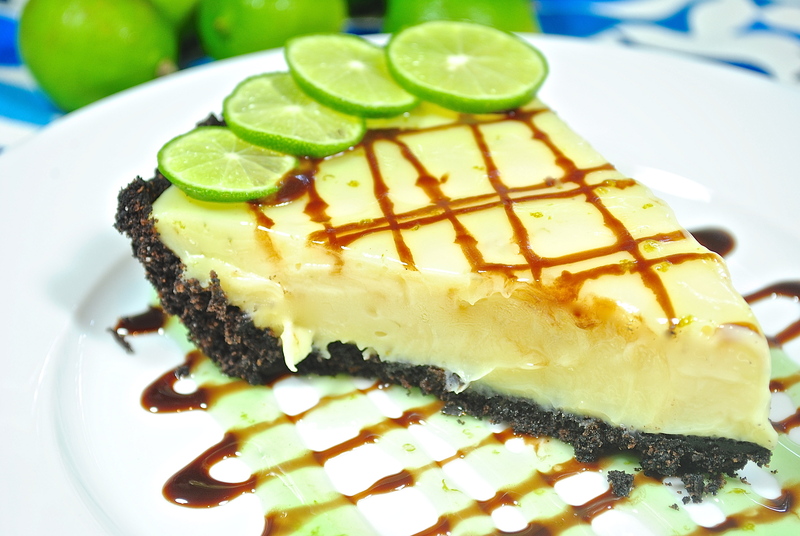 Decorate pie with lime slices. Hook’d Pier Bar and Grill’s Pie. Their version was just the cream and white chocolate, no sweetened condensed milk or eggs in this version. These are the plate scrapers from Smucker’s. If you want to order these there is a six bottle limit. The Plate Scrapers come in Key Lime, Chocolate and Raspberry. I mixed and matched my bottle. Here’s the site. Personally, I wouldn’t fool with making the key lime sauce and you don’t have to use it at all for this recipe. Just makes a really pretty plate presentation. Heat the one cup whipping cream until hot. Turn off the heat and add the white chocolate chips. Let this set for about 5 minutes then stir until all the chips have melted. Set aside. 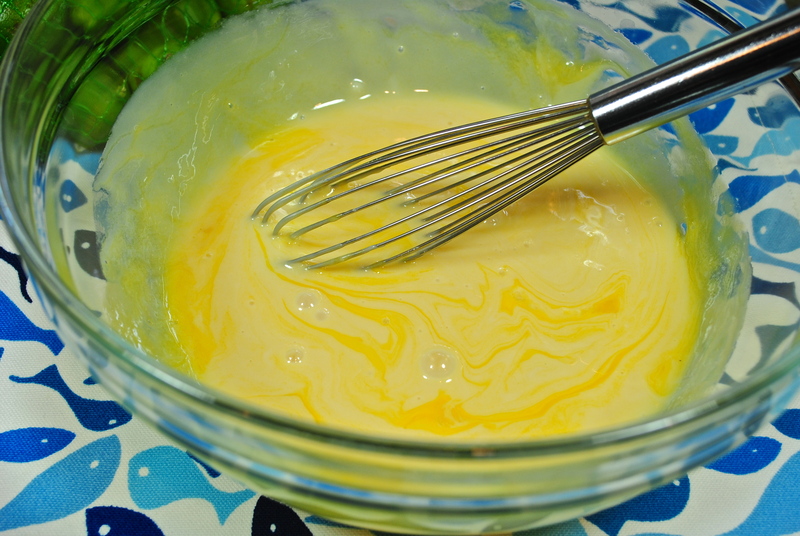 In a mixing bowl combine the condensed milk, lime juice and egg yolks. Whisk very well until blended. Stir in the cream/chocolate mixture and mix well. Pour into your prepared shell. Bake at 325 for 15 minutes. Let cool completely on wire rack and then refrigerate until very cold. 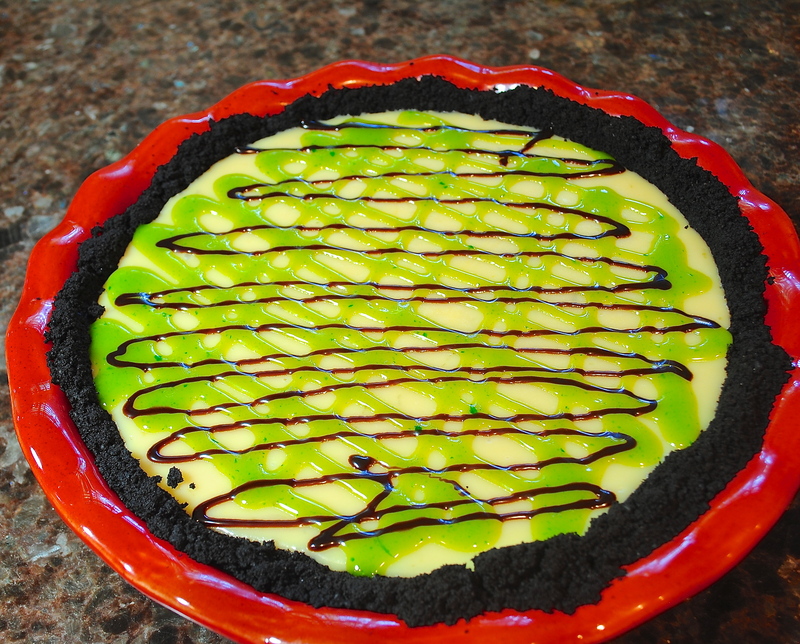 To decorate top, drizzle some chocolate sauce (I used chocolate syrup out of a bottle) criss-cross both ways and then go back with your key lime sauce and do the same. *Note: A note on the limes. Persian limes are more tart than the key limes plus you do not have to squeeze as many. Next time I will use part key limes and part Persian limes. I would like a little more tartness to the pie but I want to still be able to call it KEY lime pie. In small bowl, dissolve the cornstarch in the 3 tablespoons of water. 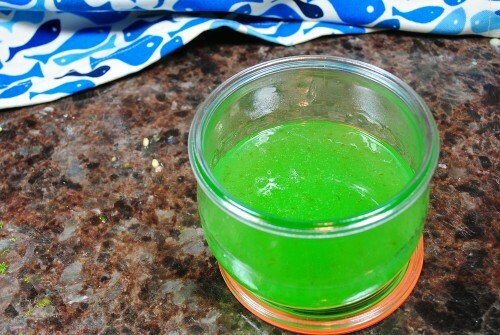 In saucepan, stir together the 1/2 c. sugar and lime juice and 1/4 c. water. Bring to a boil over moderate heat to dissolve the sugar. Stir in the cornstarch mixture and boil, stirring for 30 seconds until lime sauce thickens. Add a “tiny” bit of green food coloring (gel or liquid) to make a light green. Pour the juice, sugar and water into a small saucepan. Stir over medium heat. Do not bring to a boil but continue stirring until the sugar has completely dissolved. Bring to a boil now and reduce to a simmer and allow to continue cooking for 1 minute. 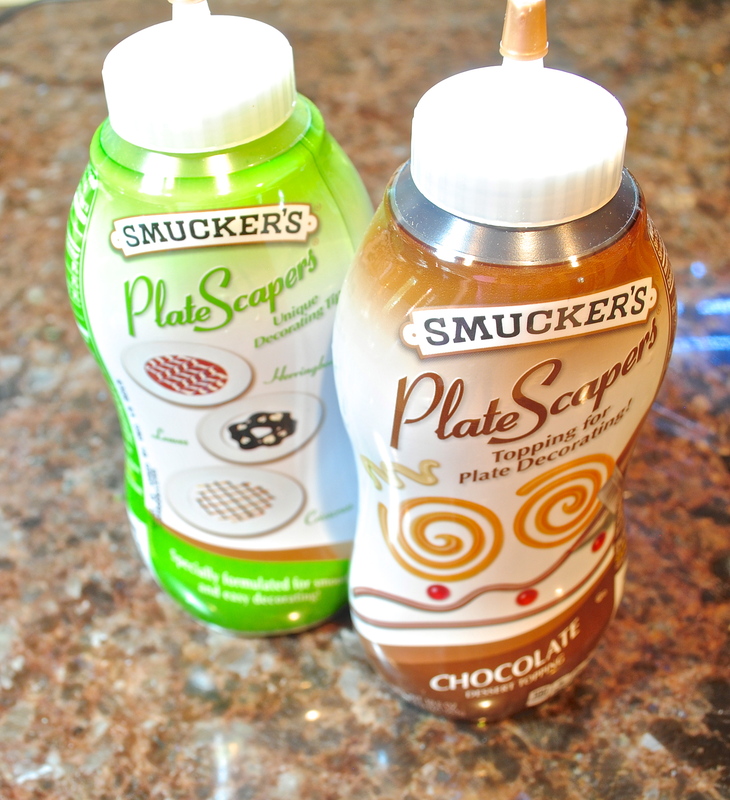 Remove the syrup from the heat. Allow to cool or chill before using this to decorate your pie. Looks wonderful. Where is the picture of you? Pie looks yummy! Loved the photos! How fun is that? Lovely family story! I just had this pie at Hook’d and had to find a recipe. Thanks for putting it out there. If I didn’t want the sweetened condensed milk would I just omit it and the eggs, and otherwise make it the same way? Yes Ellen. The pie at Hook’d didn’t taste like it had the condensed milk. I wanted the taste of the original key lime pie because I like CM so I took a white chocolate key lime pie recipe and made that one and also the regular key lime pie recipe and simply combined the two. Makes a larger pie than just the original version.